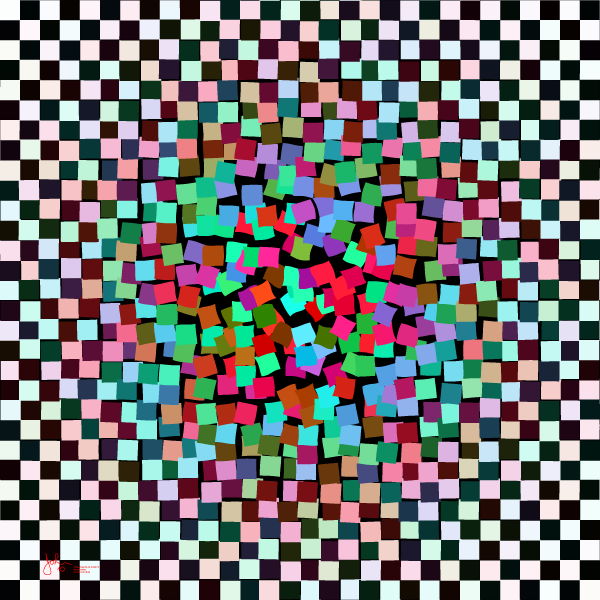 Here we have the same pattern adapted to a radial format, with disorder in the center surrounded by order. My private name for this is "the art colony". The members of the colony think of themselves as colorful and vibrant, while all around them stretches a vast dreariness of philistines of interest mostly as customers for their free-spirited art. Some wonder why the "chaos" side of things must be the colorful side. The logic of this is hard to avoid. Few things are as orderly as a two-color checkerboard and in general the fewer colors the more order. Continuation of this thinking says that order will involve a maximum spread in colors, as seen here.